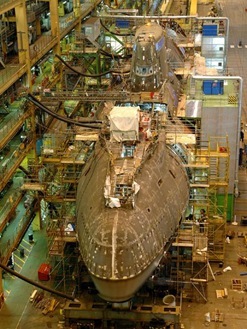 HMS Astute, the biggest and most powerful stealth nuclear attack submarine, being built for the Royal Navy (RN) is ready to commence her first set of sea trials. 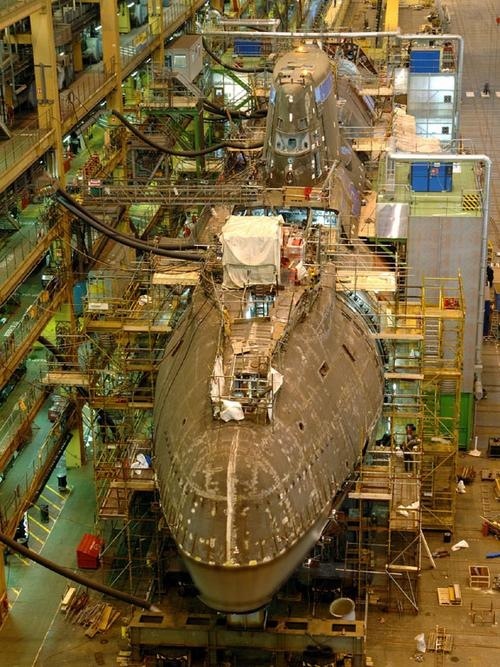 Three more Astute class submarines Ambush, Artful and Audacious are under construction by BAE Systems shipyard at Barrow-in-Furness in Cumbria. 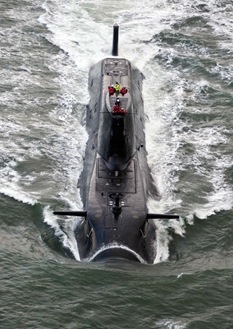 Astute is expected to be available for deployment by RN in 2010. More complex than a Space Shuttle. Sonar suite has the processing power of 400 laptop computers. 97 metre long and the length is more than the length of 10 London buses. Has 11.2 metre beam that is more than the width of 4 London buses. To displace 7800 tonnes of sea water when fully loaded, equivalent to 65 blue whales or 975 unladen London buses. Has around 110 km of cabling and pipelines, that is equivalent to driving from Bristol to Oxford. Has more than three times the displacement of the last ‘conventionally’ powered submarine (HMS Upholder) built for the RN. Will be able to carry more torpedoes and tube launched missiles than any previous class of RN submarines – nuclear or conventionally powered. Can circumnavigate the world without surfacing and its dived endurance is limited only by the amount of food that can be carried and the endurance of the crew. Her sanitary fittings comprise five showers, five toilets, two urinals and eight hand basins for a crew of 98 (the Commanding Officer has his own hand basin). First RN submarine not to be fitted with optical periscopes. Has individual bunks for the whole crew and eleven extra bunks for ‘passengers’ and ‘sea riders’. Can produce its own oxygen from sea water to replenish the onboard atmosphere. Can purify the onboard atmosphere by removing and disposing of waste carbon dioxide, hydrogen and carbon monoxide. Can operate independently of the earth’s atmosphere for extended dived periods. Can compact and store onboard all the food waste and garbage arising from an extended patrol for eventual disposal on arrival back in harbour. Faster underwater than on the surface. Uses Sonar 2076 that has the world’s largest number of hydrophones of any sonar system in service today. On a 10 week patrol the crew would get through (on average) 18000 sausages and 4,200 Weetabix for breakfast. A team of 5 RN chefs (1x Petty Officer Caterer, 1x Leading Chef and 3x Chefs) provide 24 hour service to the crew of 98. Here are some photographs from Royal Navy: HMS Astute during construction and leaving Barrow-in-Furness on her maiden voyage to start sea trials. View a video clip of HMS Astute leaving Barrow-in-Furness on November 14, 2009. For more details, log on to Royal Navy.